Welcome to the 2018 football season and our first edition of The Pick List. Each Thursday throughout the regular season, The Pick List will feature six of the best match-ups across the state, and make our predictions on a handful of other games. The schedule-makers have once again failed to do Blue Valley any favors. After opening the past two seasons against defending 4A-I champion Bishop Miege, this season the Tigers will travel to last year’s Class 5A runner-up, St. Thomas Aquinas. But such is life in the Eastern Kansas League where each week features at least one ranked showdown. That will be the case on Friday when the Tigers and the Saints kick off the new season. Aquinas defeated Blue Valley, 47-20, in Week 8 of the 2017 regular season. The two teams then went on to successful playoff runs. Blue Valley reached the state semifinals, capping an 8-4 season that provided healing for a community trying to cope from the sudden passing of head coach Erik Driskell in February of 2017. Coach Allen Terrell led the Tigers back onto the field, and eventually to the state semifinals where they fell 44-37 in two overtimes to eventual champion Blue Valley North. Aquinas reached the Class 5A state championship game where the Saints came up short to Bishop Carroll, 38-28. Blue Valley suffered less of a hit to graduation than the Saints. The Tigers bring back 15 total starters including part-time starting quarterback Walker Kinney. Alex Totta also returns as one of the state’s top two-way players. Totta earned Kpreps Class 6A All-State honors as an all-purpose player after rushing for 800 yards and posting 143 tackles from his linebacker position. The Tiger defensive secondary will again be led by the speedy Eric Olsen, also an all-state selection with 91 tackles and three interceptions a year ago. Aquinas, on the other hand, brings back only seven total starters, but a roster full of high-level talent. Offensive lineman Joe Michalski is a multi-year all-state performer and has committed to Oklahoma State. Defensive tackle Javier Derritt is also a returning all-state selection and has made his commitment to North Dakota State. Jayden Russell is a is a talented defensive back with multiple FBS offers. Junior defensive end Matthew Roberts (6-2, 205) can be a force off the end, while his “little brother” Jaeden Roberts (6-5, 335) will eventually have his pick of where he wants to play at the next level. 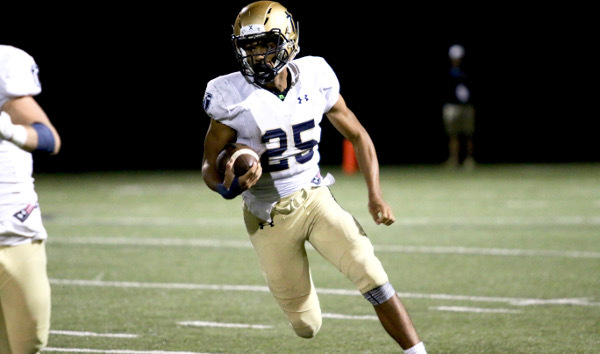 The Saints offense will be breaking in a new quarterback, but all 5A selection Cameron Jackson returns in the backfield after a junior season in which he rushed for 1,400 yards and 19 scores. Blue Valley has won seven of the past 11 meetings in this series, but the Saints’ talent may be enough to pass this early season test. The City League powerhouses and two of the top-five teams in Class 5A meet for what could be the first of two matchups this year. Last year, Northwest lost to Derby in the 6A sub-state title game, and Carroll won the 5A crown. This is the fifth straight year the teams meet in the season opener. Last season, Carroll won in the season opener against the Grizzlies in the final seconds, 40-35, behind a big performance from Braden Howell, who eventually collected Top 11 all classes honors. Northwest went finished 10-2. Carroll held the Grizzlies, the No. 1 scoring offense in 6A, to its second-lowest offensive performance. In ’16, Northwest won 61-49. In ’15, the Grizzlies defeated Carroll, 31-24. In ’14, Carroll won 43-14. Last year, Carroll went 12-1 behind first-year head coach Dusty Trail, the longtime assistant coach/offensive coordinator to Alan Schuckman. The Golden Eagles averaged 40 points a contest and permitted 21. Northwest had a sizable defensive improvement in ’17 and dropped down 22 points a contest. Both squads have a bevy of star power. Carroll tight end Clay Cundiff has committed to Kansas. Senior running back Jackson Nichols had a solid ’17, and wide receivers Mason Baalmann, Cade Becker and Gunner Lynch were all returning wide receivers. For Northwest, defensive end Marcus Hicks (Oklahoma) and running back Breece Hall (Iowa State) headline a talented team. Hall, in his first year as a starter, rushed for 2,082 yards and 32 scores. Senior Roy Johnson helped in all phases with 1,030 rushing and 410 receiving with 13 offensive touchdowns. The top-three tacklers all return with first team all-state linebacker Josh Carter, one of the state’s strongest players. Carter delivered 143 tackles. Percelle Finch had 71 tackles, 13 for loss. Hicks finished with 63 tackles, 19.5 for loss. Overall, six offensive and nine defensive starters return for Northwest, and eight offensive and six defensive starters for Carroll. Both teams have new quarterbacks. Carroll has plenty to make another deep run, but Northwest is arguably the most talented team in the state. The two Central Kansas League powers square off for the fifth straight year. Hoisington won the first three matchups 21-7, 34-14, and 32-14. Last year, Pratt earned a 35-28 victory. Two seasons ago, Pratt won the 4A-II state title with its only loss to Hoisington. The Cardinals finished in the Class 3A sub-state title game. Last season, Pratt surprisingly fell to Kingman in Week 9 and finished 7-2. Hoisington won a playoff game and finished 7-4. The Greenbacks return plenty of standouts, many whom will be in different positions. Additionally, Pratt has shifted down to 3A, while Hoisington is 2A. Pratt senior Travis Theis, one of the state’s best players regardless of classification, switches from running back to quarterback. Theis played some quarterback as a freshman after an injury to Landen Studer. The last two years, he delivered 1,975 and 1,691 rushing yards. Theis will move from defensive back to linebacker. On the offensive line, Andres Fernandez moves from left tackle to center. Hunter Huber was an all-state guard and will play fullback. Caden Blankenship averaged more than eight yards per offensive touch in an injury-plagued season. Kadence Riner had 56 tackles for honorable mention all-state. Hoisington, known for its prolific running attacks the last several years, graduated all-state running back Sean Urban. He helped Hoisington average 269 rushing yards a game and 18 passing yards a contest. Urban recorded 185 carries for 1,539 yards and 23 scores. Junior Wyatt Pedigo was one of the state’s top sophomores with 88 carries for 630 yards and seven TDs. He was second in tackles with 70 stops and was the only one of the top-six tacklers back. Sophomore Mason Haxton completed 17 of 41 passes for 182 yards with a 1/3 TD/INT ratio. He had 44 carries for 150 yards and three scores. Pratt had an average score of 37-23 in ’17, while Hoisington was at 33-18. Hoisington retools very well in the backfield and should again have a big year running the ball. A healthy Pratt is a strong contender in deep 3A. At this point, the Greenbacks have the depth edge on the Cardinals, and Theis is one of Kansas’ best. This Big 7 Conference showdown used to come in district play, but now gets pushed to the season-opener with the new classifications. The defending Class 3A champion Sabetha Bluejays were among the 16-largest 3A schools that are combined with the former Class 4A, Division II to form the new Class 3A. Nemaha Central is now in Class 2A – the class made up of the collection of remaining 48 schools that formerly made up Class 3A. During the 2017 season, Nemaha Central held the top spot in the Class 3A rankings for eight consecutive weeks. In the end, it was the Big 7 Conference rivals, the Sabetha Bluejays, that stood on top as champions. Nemaha Central actually handed Sabetha its only loss of the 2017 season; a 21-7 defeat in the district opener. In fact, Nemaha Central has defeated Sabetha nine straight times in the regular season, only broken up by a 2014 victory by Sabetha over the Thunder. Entering this season, it’s Sabetha with all the returning experience. Lineman Elliott Strahm (6-2, 260) grabs the headlines thanks to his incredible junior campaign last fall. The Bluejays also return three capable weapons in the backfield. Backs Joe Gruber (1,200 yards, 13 TD), Mason Engelken (970 yards, 12 TD), and Gabe Garber (670 yards, 14 TD) all return. Garber is expected to take over for the graduated Brandon Brownlee at quarterback. On defense, Strahm anchors the defensive line, while Garber keys the linebacking group. It was Garber’s late interception at the goal line that secured Sabetha’s 7-6 victory over Marysville in the 3A state championship game. Nemaha Central returns nine total starters. Standout athlete Mitchell Henry has graduated after posting 2,000-yards of total offense. Gone with him is the entire Thunder offensive line, including all-state selection Eli McWilliams. The backfield returns some experience in Noe Gauna an Luke Reitz, and Matt Baumgartner and Cole Kramer provide receiving targets. If the Thunder are going to defeat Sabetha for a tenth consecutive time int eh regular season, they’ll have to slow down an experienced Bluejay offense that ran the football on 94 percent of its snaps a season ago. Rossville will visit Class 1A’s second-ranked Centralia in an intriguing matchup to open the 2018 season. The Bulldawgs and Panthers have met four times in recent years. The two schools last played in 2014 and 2015 with Rossville posting wins of 42-6 and 59-13, respectively. Rossville also won in 2011 (34-8) with Centralia taking the 2010 meeting by a score of 20-13. After three consecutive Class 3A state championships, Rossville couldn’t overcome heavy losses to graduation and posted only a 2-7 record in 2017. This season, the Bulldawgs return 17 total starters including nine on defense. In recent years, the offense has been highly reliant on the production from the quarterback position. Last season was no different as Sheldon Hulbert accounted for more than 2,250 total yards, or 82 percent of the team’s total offensive output. This season, the quarterback position may be taken over by Gabe Carver who saw limited time last season. Bo Reeves and freshman Torrey Horak, former Rossville great Tucker Horak’s brother, may also see time. Trevor Johnson returns at running back, and receiver Elijah Daughty had 630 receiving yards a season ago. Centralia rebounded from an injury-riddled 1-8 season in 2016 to reach the state quarterfinals last season. The Panthers return several key pieces from last year’s team including all-state offensive lineman Derek VanDorn. VanDorn will be joined up front by Nathan Haufler and tight end Deagan Steinlage (6-6, 240). Kamble Haverkamp will likely take over at quarterback replacing all-state selection Trenton Flentie. Flentie rushed for nearly 1,300 yards and 17 touchdowns while adding 500 passing yards. As a freshman, Haverkamp stepped in for an injured Flentie during the 2016 season. Last season Haverkamp rushed for more than 500 yards and had more than 300 yards receiving. Isaac Gore also returns in the backfield after posting solid playoff performances once returning from injury. Centralia has 15 upperclassmen with 22 sophomore and freshman. Two ranked eight-man teams square off in a key Central Prairie League contest. From ’04 to ’17, these teams have met every year except ’10. Victoria holds an 8-5 advantage in the series, though Otis-Bison is 5-3 in the last eight meetings, including winning the last two. Three years ago, Otis-Bison played a dominant Victoria team that eventually won a state title close into the second half before a flurry of big plays led to a 68-22 Knight win. The Cougars won 46-36 and 22-20 the past two seasons in games that were decided late. Otis-Bison went 10-2, while Victoria finished 7-3 in ‘17. Coach Travis Starr called last year’s win a big turning point for Otis-Bison as the Cougars were down multiple players due to injuries. Both quarterbacks return for senior-laden teams. Cougar senior Anton Foust threw for 883 yards with a 20/2 TD/INT ratio. He rushed 138 times for 1,171 yards and 20 scores. Senior wide receiver Maitland Wiltse recorded 19 catches for 453 yards and 12 TDs. Senior Luke Higgason is a four-year starter and will be on the offensive line. He led the team with 14 TFLs. Junior Brevan Gradig (99 tackles) is expected to play running back after all-stater Blake Bahr graduated. Otis-Bison listed just 14 players on the roster last fall and is up to 19 this year with five seniors. Cooper Windholz is a rare returning quarterback for Victoria and has progressed as a passer. He posted a solid season with 594 passing and 308 rushing and 15 touchdowns. Windholz took over as the signal caller in the middle of a big Week 1 weather-delayed win against Central Plains that started Friday and ended Saturday. Coach Doug Oberle expects Victoria to have multiple players in the backfield all year with seniors Layton Riedel, Walker Braun and Tyler Knoles and sophomore Jayvon Pruitt. Oberle believes all four will see plenty of reps. Knoles is the most experienced player in the backfield. The line features 6-foot-5, 325-pound senior starting center Jacob Schroeder, along with lineman Jake Wellbrock and Wyatt Dreiling. Coach Oberle has said Schroeder – who has earned combine attention because of his size - has made significant improvements in athleticism and hip bend since the end of last season. Junior Kirk Huser, who didn’t play last fall because of a labrum injury, has been a pleasant surprise and will start at nose guard and right guard. Senior Caden Oberle, like Wiltse, causes matchup problems on the edge as a returning end. Coach Oberle believes Wyatt Dreiling could be one of the better defensive ends Victoria has had. A huge key will be stopping Foust on quarterback lead runs and the passing game on the edges with Wiltse for Otis-Bison and Caden Oberle for Victoria. The 190-pound Foust is expected to have a high number of carries and is hard to bring down.